Buddy Paddles Simcoe is about one of our first COPE Service Dogs Buddy , who became a Canines In the Classroom Dog. Buddy is now 12 years old and will be retiring from his career and to celebrate he will be riding a paddleboard on Lake Simcoe with the Founder of COPE Jane. 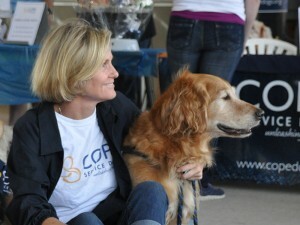 Buddy has made a significant difference in many youths lives over his career with the Canines In the Classroom Program. Buddy creates a calming effect with his students, helping them to gain confidence, learn communication skills, manage their emotions and become more social which helps them make new friends. Please follow Buddy on twitter @BuddyPaddles. Buddy’s new website buddypaddlessimcoe.com is up and running and lists all of his stops. July 29, 2018 – 3:30 pm Buddy and Jane’s adventure begins at Innisfil Beach Park!